Don't lower your sales goals. Raise your expectations. Many struggling retailers have tried lowering their prices in order to go head-to-head with deals and discounts that can be found by shopping online. While this may increase revenue in the short term, it destroys your profit margins and hurts your bottom line once the sale is over. Take a more long-sighted approach by implementing the training techniques in this FREE eBook. 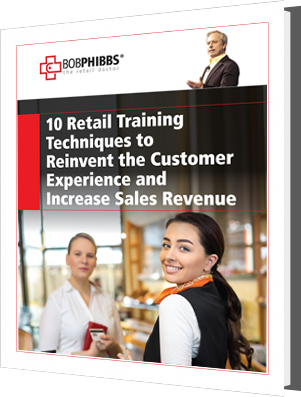 Download 10 Retail Training Techniques To Reinvent The Customer Experience And Increase Sales Revenue now! Working with The Retail Doctor was an extraordinary experience. He quickly grasped my businesses' needs and concerns. Bob had immediate suggestions for improvement for my 8 stores that were easy to implement and cost effective. His focus on customer centric sales experiences has already helped our team learn to connect with our customer on a higher level. Our staff is now earning trust and thus increasing sales. I look forward to ongoing work with Bob as we strive to double our retail footprint. I believe The Retail Doctor has the knowledge and experience to help us achieve that long term goal.